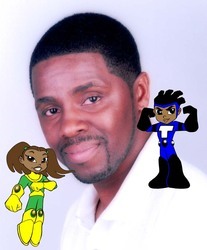 Since 1987, Reggie Byers has created, written and illustrated comic books professionally. He got his first break penciling ROBOTECH comic books for Comico. The comics were the American licensed comics basedon the popular Japanese anime, "MACROSS." He illustrated ROBOTECH for 2 years. After Comico, he self published a variety of comic books which includes: SHURIKEN, about a female ninja, "JAM QUACKY THE HIP-HOP DUCK" and currently, "KIDZ OF THE KING", which he produces with his wife of 20 years, Dionne. Founded on the Bible scripture, Galatians 3:26, KIDZ OF THE KING is a Christian comic book that teaches its readers how to live their lives according to the Bible and is currently published by UMI Inc out of Chicago, Illinois.